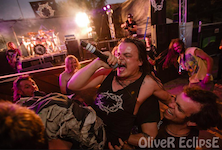 And of course there will be a fully theatrical intergalactic space heavy metal crew, tongue in cheek performers in full costume, fighting theatric wars taking on the goblins as 28 Heavy Metal bands descend on Alice for gigs on Saturday and Sunday. ERWIN CHLANDA reports. PHOTO: Impresario Pirate performing last year.